Late Game Heroics, Crunch Time Performer: In 2006, Davis caught a game-winning 24-yard TD pass with 1:53 remaining in a comeback victory at Minnesota and his 30-yard reception set up Robbie Gould’s 49-yard field goal in overtime in a playoff victory over Seattle. Davis is recognized for his production in close, meaningful games, and when the Bears need to step up they have called upon #81 (Davis’ number) to have an impact and he’s done just that. There’s no doubt he will be a valauble weapon for the team in ’08 because he can be counted on to get open and make the big play. Rashied is a difference-maker and I expect him to only get better. Look for the Los Angeles native to play an extended role, along with being a key option in the Bears offensive game plan. Urlacher Denies Report Of Retirement: Chicago Bears All-Pro LB Brian Urlacher has made it known that he is not contemplating leaving the NFL if the team does not give him more ca$h. The former New Mexico standout and 9th overall selection of the 2000 Draft is considering sitting out mini-camp and training camp unless he gets a new deal. According to the Chicago Sun-Times, a league source said the 2006 Defensive Player of the Year is looking at the possibility of retirement because of neck and back problems. Urlacher Speaks: “I never said I was going to quit,” Urlacher told the Chicago Tribune on Friday. “That’s just a gossip column. Reports like that is why I don’t talk to the media.” Urlacher, who is seeking a multi-year extension on top of the nine-year, $57 million contract he signed in 2003, is not participating in the Bears’ voluntary workouts. 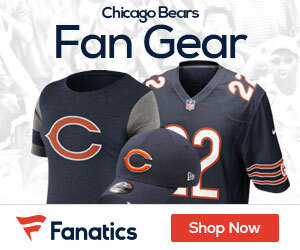 However, Urlacher indicated that he has no plans to boycott training camp in July. Urlacher, who turns 30 next month, underwent minor neck surgery in January. He also continues to deal with arthritis in his lower back. Urlacher Conclusion – Contract Extension Situation: Urlacher last season looked like he lost a step due to injuries, though he put up good numbers – piling up 123 tackles, 5 sacks/interceptions, defensive touchdown – would it be a good investment to extend his deal? I would like to hear from the BearsGab.Com readers and would love to get some feedback on what the Bears should do with #54. 5 Reason To Extend Urlacher’s Deal: 1. My first inclination towards the contract talks when brought up (Face Of Chicago) was that we definitely had to meet his desire and answer his plea for a new deal – just because he’s Brian Urlacher. 2. I thought this because he is getting underpaid compared to other middle linebackers that are nowhere as accomplished nor good as he is. 3. How could we go about our defense without Urlacher leading the unit, when without him we are 0-7, and it would take awhile to adjust to him not being on the field. 4. Who would we have to replace him? Urlacher has not missed a game since ’03! We need our defense to play it’s absolute best because the offense does not pick up the slack. 5. We have around 15 million available in cap room – shouldn’t we use what we have on our best defensive player? 5 Reasons Not To Extend Urlacher’s Deal: 1. He is already 30 and you can see that his back/neck are serious concerns, and it seems like he’s always plagued with some type of injury. 2. He’s not going to get any better – right? 3. We already gave a younger Briggs (26) a new deal and he had to wait one year to get what he wanted. 4. Tommie Harris, Devin Hester, and Robbie Gould have more years to go in their prime, obviously and they want the $ too. 5. Why should GM Jerry Angelo change his philosophy/standards and make an exception to Urlacher by re-working the deal he originally signed? Shouldn’t Urlacher have to wait until the deal runs out and the front office has to stick to what makes them successful. You have to stay true to your plan and see that Urlacher is on the decline – so why spend the money when he’s signed through 2011. Keep in mind the way they handled Briggs turned out well and you have to be patient with this situation. If I truly believed it was Urlacher demanding a trade I would say honor him and see what interest there is on the market. But because I feel most of this drama is agent/media driven. I don’t think we should do anything with him simply because he signed a more than fair contract a few years ago and there are still years left on it. Now what I would do depending on the year he has is to give him an extension next year that would make him a bear for the rest of his career. After watching Jamar Williams last year I am becoming comfortable with life after urlacher. Jamar Williams is still unproven but I like his game and he has the skills/instincts necessary for the LB position – in order to be a good defensive player – albeit as an outside linebacker. If not keep him – but with all means necessary, don’t with the slightest bit, give in to him, we should not break the bank for him and we won’t. The $ used for contract extensions should go towards the BEST Return man in the NFL, The Windy City Flyer Devin Hester & the best interior DL in the NFL Tommie Harris.